but don't stop when Nico finishes - a great Alex Harvey interview followed by the classic "Next"
The two tracks are on the 2012 remastered 2CD reissue of The End. 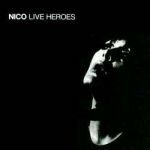 But never thought it possible to see Nico playing these songs in such good quality. Would this be the track played by the BBC in "The Man Who Recorded America: Jac Holzman's Elektra Records"? I thought it odd at the time (2010) because it was released on Reprise.